As December winds down, we find ourselves in the final throws of 2018. 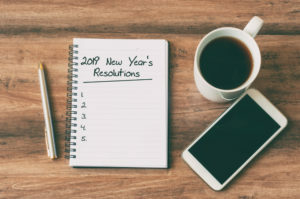 With 2019 around the corner, many of us will engage in the common tradition of making New Year’s resolutions. From weight loss to career goals everyone will have their resolutions ready and their “New year, new me” mantras ready to back them up. However, many people find out it takes more than a mantra to commit to their goals and a whopping 80% of resolutions fail by the second week of February. This may sound daunting but don’t let a fear of failing stop you from making new year’s resolutions. Here are 5 tips to ensure you stay on track and achieve your new year’s resolutions. A common mistake with many New Year’s resolutions is often times they’re too big or too broad. Wanting to make a new career change, for example, has a lot of involved details that might leave you overwhelmed and afraid. Instead of wanting to make a career change, learn a new skill with the intent to make a career change. By committing to learning a new skill as opposed to making a drastic leap, you’re more able to see the smaller specifics of learning a new skill and can easily implement it in your every day. A career change can be a long-term goal that is achievable in smaller steps every year. This ties in with setting small goals. When attempting to make changes start with one change at a time. If you approach your resolution from multiple angles, you’ll quickly find yourself overwhelmed. Unhealthy behaviors develop over the course of time. Likewise, you’ll need to work on changing those habits over time. For example, say your new year’s resolution is to get healthier and you are a smoker, have a propensity to frequently snack on junk food, and you haven’t seen a gym in months. Instead of attacking all three of these habits at once, pick one and work on changing that habit. Perhaps focus on smoking less first. Once you have succeeded in changing one habit, you’ll find it easier to conquer the other two the same way. Making new year’s resolutions can be seen as solitary goals we make and try to achieve on our own terms, but this thinking can also make you feel more isolated. Instead of keeping your new year’s resolutions to yourself, share your goals with your friends and family. Sharing your moments of vulnerability with family and friends can help relieve feelings of uncertainty and help you not feel so alone. Not to mention you never know who in your family might have had similar goals and achieved them. They can give you a proper direction, so you too can achieve the same level of success. Finally, beating yourself up for making mistakes along the way is a sure way to thwart any headway you intended to make in your new year’s resolutions. Perfection is unattainable. It’s rare anybody can make the decision to do something and they get it right on the first try. You missed the gym for a week due to work or you ate a box of donuts on the break home because you were stressed out. Instead of beating yourself over these actions, seek to resolve them and get back on track. One significant component to goal setting is getting grit and pushing through to the end. Changing old behaviors isn’t easy and slip-ups are expected. Don’t push yourself so hard. If you’re ready to make a commitment to ring in a new you for 2019 reach out to Lifeworks. Our team of licensed psychologist and professional counselors offer a broad spectrum of expertise to assist in developing new life strategies for all of our patients in the far north Dallas area. Contact us today to schedule an appointment to get on track to be a new you this new year.